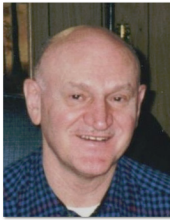 Josef Preisz, 80, passed away peacefully with family by his side on February 10, 2019 at the Horizon Senior Living in Gladwin, Michigan. Josef was born on August 18, 1938 in Dag, Hungary and moved to Detroit, Michigan with his family, at the age of 12. He served in the U.S. Army from 1958-1960 and was honorably discharged from the U.S. Army Reserve in 1964. He retired from the Wayne County Sheriff’s Department in 1990 after 23 years of service. Josef was a devoted father and grandfather, and loved watching and playing soccer. He also loved listening and dancing to polka music and traveling with his family. Josef is preceded in death by his father, George Preisz and mother, Maria (Szabo) Preisz, as well as his sister, Anna Eberhardt, and brothers, George Preisz, Stefan Preisz, and John Preiss. He is also preceded in death by his son, Walter Preisz, and daughter, Monica Preisz. He is rejoicing with God and all of them now in his heavenly home. Josef is survived by his daughter, Marlene (Jerome) Smalley of Gladwin, grandchildren Kevin (Sierra) Smalley of Grand Rapids, MI, Christopher (Kayla) Smalley of Canton, MI, and Melanie Smalley of Grand Blanc, MI, and great grandchildren Tobin and Camilla, as well as numerous nieces and nephews. They will all cherish his memory as a great man who lived an honorable life. Josef’s family would like to extend heartfelt thanks to the wonderful staff at the Gladwin Horizon for providing such great care to Josef for many years and especially during his final days. The staff of MidMichigan Home Care Hospice was also wonderful and greatly appreciated during his final days. Friends and family are invited to honor Josef’s memory at 11 a.m. on Friday, February 22, 2019 at the Great Lakes National Cemetery in Holly, MI. A luncheon and celebration of Josef’s life will take place at Andiamo’s restaurant in Clarkston, MI, following the ceremony. To send flowers or a remembrance gift to the family of Josef Preisz, please visit our Tribute Store. "Email Address" would like to share the life celebration of Josef Preisz. Click on the "link" to go to share a favorite memory or leave a condolence message for the family.